The Asian stink bug -- aka the brown marmorated stink bug or Halyomorpha halys -- made his presence known in the United States in 2001 when he was discovered in Allentown, Pennsylvania. In his native Asia, the brown marmorated is a pest who destroys fruit trees and soybean crops. In the United States, this stink bug is primarily a household and garden pest. Concerns exist that he may become an agricultural pest. An adult Asian stink bug lives for 6 months to 8 months on average, according to agricultural scientists at Rutgers University. Because this bug is not native to North America, he has few natural predators. These bugs breed outdoors from June to September, but their searches for warmth during the colder months in North America is problematic for householders. In the United States, it appears that each breeding season produces only one generation in the north. However, it is believed that this might change as the stink bug migrates south to warmer climates. 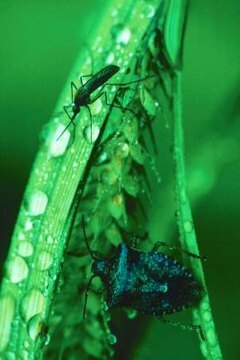 In China, stink bugs can produce five generations in one breeding season.